Colin Fischer is a modern-day Sherlock Holmes, and his story–as told by the screenwriters of X-Men: First Class and Thor–is perfect for readers who have graduated from Encyclopedia Brown and who are ready to consider the greatest mystery of all: what other people are thinking and feeling. My thoughts: I remember reading my first book with an autistic character in grade school—Babysitter’s Club #32, in which Kristi babysits for an autistic girl. From then, I’ve always been interested in meeting people who fall on the spectrum. I’ve been friends with several individuals with autism, and Mister BS is a special educator and thus has a professional interest in people on the autism spectrum. I have friends with children who fall on it. My current WIP also happens to feature a secondary character who is autistic. I share this information about my personal relationship with people on the autism spectrum to give context to my experience with this book. I approached it with a rather critical eye, and it still proved a quick, fun read. There are no unnecessary scenes in Colin Fischer, no annoying backstory, and no meandering plot, which made this a slim, easy read, perfect for reluctant readers. Colin is an instantly relatable character, endearing not just in spite of, but because, he is sort of prickly and awkward in his relationships with people. Individuals on the autism spectrum are difficult to capture honestly because there is so much diversity. Authors risk relying on cliches or being unbelievable, but Miller and Stentz manage to bring Colin to life with exceptional authenticity. The secondary characters are enjoyable even if they lack depth. Colin’s brother is annoying in a very ordinary way, given their relationship, and kids who sometimes struggle to get along with siblings will relate. As an adult, I liked the hint of his parents relationship, though it’s only seen through his eyes. There’s the bully, the “bad kid” who’s really a “good guy” underneath, mean girls, and the nerd-turned-beauty who befriends Colin, which all seemed stereotypical, but I was surprised by the basketball coach, who refused to do the easy thing and forced Colin out of his comfort zone. The writing team is trained in screenwriting and they’ve written successful action hero flicks, and it shows in this very cleanly and economically plotted story. The novel only covers the span of a couple of days, but within that timeframe manages to develop characters readers will care about and a mystery that while not epic in scope is an interesting puzzle to solve. Sprinkled throughout the story were lots of footnotes that expanded on tidbits of knowledge relevant to the story and Colin’s diary entries, which I thought was a cute structural quirk and fit well with the tone and style of the novel. Yes, it was a little gimmick-y, but I think it will appeal to kids graduating form the diary novels popular with middle graders. Though most adult won’t find it more than “cute,” I think it could be a popular series for younger YA readers who enjoy mysteries and Hollywood would find it easy to adapt for film or television, and the right director and actors could make it a fun family flick. This is a story about bullying; about gun violence; about gangs; about family, and siblings; about first crushes. 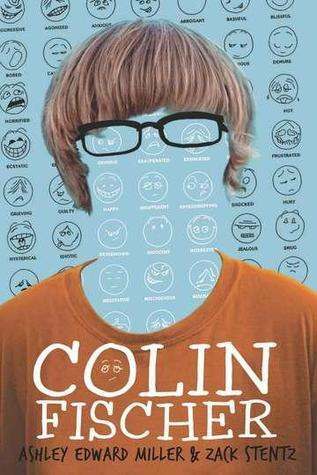 Teenagers will relate to Colin’s difficulty to find out what people are really thinking, even if they don’t share his condition. Readers won’t be able to help themselves from cheering him on as he stands up for what he believes in and pushes himself out of his comfort zone in pursuit of the truth. Fans of Marcelo and the Real World by Francisco X. Stork (which I loved and reviewed here) will likely enjoy Colin Fischer, but younger readers who enjoy mysteries are also a great fit for this novel. Well, I like books that read like movies, plus everything else you say about it is good, so I’ll be checking it out. Thanks for the recommendation! I did love MARCELLO AND THE REAL WORLD so appreciate a recommendation like this. Cheers! This looks great. My 5th grade daughter seems to love books with special needs characters. Will tell her about your post!